This video was designed for a live event in LA, to be played on a plasma screen. However, we created the project files to be modular, and reusable for multiple formats. For this project, NextBook gave us the challenge of working with text for their new releases. Because we had to work with so much text, we hand animated each frame to create a high definition experience, while keeping all the text present, readable, and comprehensible. Last night, The Defibulators hosted a great night of music to celebrate their new CD Release, Corn Money. You can listen for yourself on their site. But before you do, watch this video we made to promote their new album. New Album CORN MONEY out March 3rd! from the defibulators on Vimeo. Peter Radizeski and I were recently guests on Jeffrey Powers’ show, Geek-a-zine, on UStream.tv. We spoke about cell phones, the data on them (McCain’s and Obamas Blackberry issues), elections in Estonia, Yahoo email and their new social rollout, the Palm Nova, and a whole lot more. Check out the show below, and catch his show every Monday, at 7pm on Geekazine’s UStream channel. The video below was made for JDub, an NYC record label, to help them pitch their artists at a sales conference. JDub represents artists such as Matisyahu, Golem, and Sway Machinery. The purpose of the video was clear: showcase the label’s artists and their energy. Check out the video for the final product. In addition to editing the final video and delivering a DVD for the sales conference . . .
We also optimized images, logos, and videos for JDub. Additionally, we converted multiple video files from DVD’s from performances, archives, and promos. All these graphic and video files were delivered to JDub for future use. Finally, we produced this media player for all the video files. The media player can be managed by JDub without knowing any code. Buddy Ebsen Hackett is The Defibulators marketing “arm” for The Defibulators, a brooklyn based musical act. Who-ee! This is the first version of a promo video for The Defibulators‘ new album. Buddy Hackett introduces: The New Album by the Defibulators from Jaki Levy on Vimeo. We produced and edited this version in 1 very fun night. The fire in the fireplace was real and made the entire Brooklyn apartment very, very smokey. 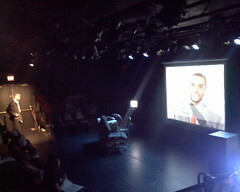 Darian Dauchanâ€™s Media Madness directed by Margaret Perry premiered at The Kitchenâ€™s Counter Culture series. The show features live video and pre-rendered video pieces and is a â€œmulti-mediaâ€ extravaganza. You can read an in-depth interview with Darian inÂ The Ithaca TimesÂ or check outÂ this great interviewÂ in The Ithacan. Surprisingly, Keynote is running it all. In the next production, Iâ€™d like to incorporate more interactivity into the piece using either Isadora or Max/MSP Jitter so I can create custom titles during the live feed. For example, there is a scene for a press conference (picture above). Iâ€™d like to have graphics and lower thirds appear that say â€œLIVE,â€ to give it a sense that itâ€™s a media circus in a fictional place by creating custom titles. However, Iâ€™ve found the delay and pixelation in these software platforms to be problematic. Produced for Ralph Lauren’s flagship store in New York City on Madison Ave and 72nd Street. The work was designed to play on 4 plasma screens simultaneously. The video was produced from a series of still images taken by myself and Robert Moon. For more on the project, visit the blog for documentation and research. Time Lapse with Music from Jaki Levy on Vimeo. I shot Part I, Dee shot Part II. For this installation 2 VCRs are networked, sending a custom made VHS tape from one VCR to another. As the VHS tape travels in the space between the VCRs, the VHS signal slowly degrades in quality. The decomposing signal on the VHS tape mirrors the disappearance of analog technology from our culture. Like audio cassette tapes and other analog technology, the VCR is on its way out. With the rise of DVRs (digital video recorders) DVDs, and other digital technologies, the VCR is now a quaint thing of the past. Taking the cue from Vinyl Records, VHS tapes are now acquiring a nostalgic status. In the installation, the top left image represents the â€œrealtyâ€ as it happens in front of us – the live feed is what our eyes see. The bottom right is what our mind keeps of that. After filtering the â€œfeedâ€ coming in through our eyes, each mind keeps its own memory, which is in fact, a minute fragment of the data that the actual â€œlive feedâ€ contained. In a day from now, what you saw in the room will remain in your brain as a few scattered images with no detail â€“ if any.